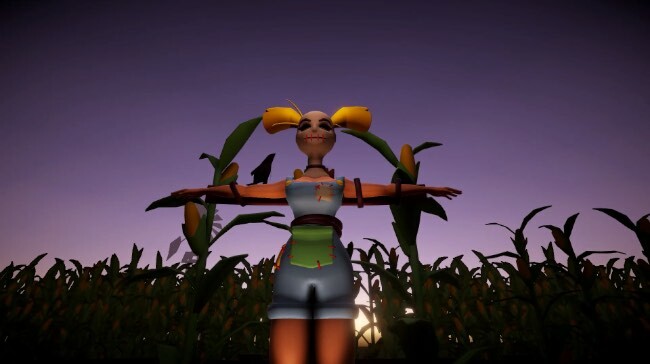 Daisy’s Farm is an odd little first person horror game where you have to avoid traps and pick fruit as fast as possible to appease a freaky scarecrow woman. In Daisy’s Farm you take control of a poor victim who has wandered into the wrong cornfield. In the center of the cornfield are six very odd looking plants that produce “Mindfruit” and a freaky looking scarecrow woman who orders you to harvest them. The Mindfruit appear randomly at each of the six plants and you have to harvest them very quickly before they go off. If you fail to harvest a mindfruit in time then you’ll die. This isn’t too hard in the early levels, but as you progress the area changes and more obstacles and deadly traps (ranging from spinning blades to laser beams) are added which makes getting to each fruit in time way more difficult. There are a couple of things that could be improved in the current build of Daisy’s Farm, most notably the lack of checkpoints and the lack of any death scenes (it just cuts to black). It’d be nice to actually see your character get maimed by the traps and the lack of checkpoints means you end up repeating the easy early sections over and over again. The actual core gameplay is great fun though, the visuals are great and it delivers a unique twist on the horror genre – a fast paced horror game where the real threat isn’t a monster, it’s your incompetence as you panic and run into a trap. A fast, fun and freaky little horror game with a lot of potential.